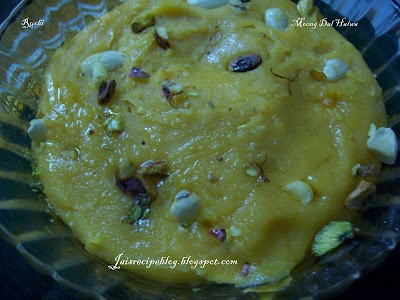 Moong Dal HalwaMoong Dal Halwa Is delicious sweet and it is too easy to prepare ! Wash and soak the moong dal for 3-4 hours (If soaking in hot water, even 1-2 hours are enough). Drain and grind it coarsely using very little water. Set aside. Prepare one-string sugar syrup by using 1 cup sugar and ½ cup water. Keep aside. Soak saffron in hot milk. Heat ghee in a thick-bottomed pan and add the moong dal paste. Stir well till they are thoroughly incorporated and the halwa is of dropping consistency. Delectable halwa, yet to try at home..yummy! 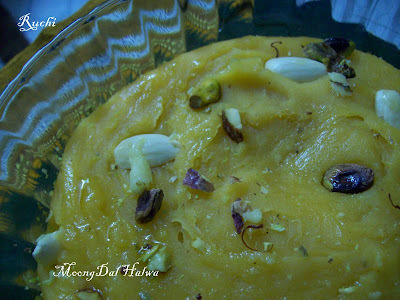 Wow halwa looks amazing tempting to have that with those nuts yumm. Hmm..Yummy!I have made once,but not making often coz of its ghee consumption!! Delicious halwa..so how u have being my dear? My mom always made this on diwali, but as i remember the stirring part was too long n tiersome.., so never thought(read had courage) of making it myself..
but this halwa really tasts yummy..
Halwa looks delicious, you can send this to my FIL-ghee sweets event dear!